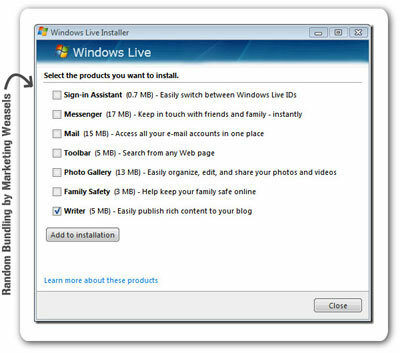 Windows live writer is a classic example of an awesome software hidden inside bad packaging that yells "influenced by marketing weasels" in every screen of its website and installer. Someone at Microsoft has an idea about building an offline blog writer with preview feature. Microsoft manages to get a team of amazingly talented designers and developers who start working on the product. This team ships the first version of their product and gets a lot of appreciation from their user base. The marketing weasels at Microsoft wake up and decide to take charge so they ask the team to "tweak" the installer slightly. As of this writing, the installer of live writer is bundled with a zillion other crappy pieces of software that you are never going to use. More than half the time the installer executable posted on the site is broken and getting live writer installed (especially if you have a bad internet connection) is a nightmare. Zoundry Raven is free, open source and has a feature which has been a primary selling point of windows live writer for all these months. After you've gone through a basic wizard and have configured your blog account, you can ask this application to download your blog template which it can then use to give you a preview option which in turn allows you to see how your post will look after it is published without having to actually publish the post. You have to manually turn on spelling checks when you start using the software. This is just a one time annoyance which makes sense since it needs to download the dictionary for your language. But then why don't the Zoundry guys just ship the English dictionary with the installer? That one beats the heck out of me. You have to click the spell check button once after you are done writing each post since there is no auto spell check like Live writer or word, but once you get used to the habit of doing clicking the spell check button once before you post is not as bad as it sounds when you hear it for the first time. You have to go into tools / preferences / affiliate links and turn the "Don't mess with my links" option to stop Zoundry guys from changing your amazon links to use their referral id and earn money from those links. A slightly shady way to make money I would think, primary because the installer did not seem to ask me if I want Zoundry Raven to change my link. A quick advice to the Zoundry guys: Either ask me upfront or turn off this feature by default. Zoundry Raven has a slightly longer startup time compared to live writer but given the fact that you are not going to be opening it up as frequently as notepad the slightly longer startup time does not have a major impact on your decisions to use this nice little application. On the plus side, Zoundry Raven has the option of running as a portable application and carrying your profile (along with your posts) on a portable drive or moving them from one machine to another is rather easy. Put simply, Zoundry Raven is a decently good alternative to Windows Live Writers (and a particularly easy option to get away from Live Writers slimy installer). For me windows live writer is a classic example of how an amazing product team and an amazing product can loose adaption just by letting the marketing weasels control even a small aspect of the product (in this case the installation wizard). The strategy of bundling some of your lousiest products with some of your best products and hoping that your customers will start using the lousy ones because they need the good ones desperately almost never works in a free world. The people who claim that this approach worked for windows and internet explorer often forget that the internet explorer and windows bundle worked because both of these were amazing products and they complemented each other. Put simply, bundling lousy products with good ones don't help in adaption of your lousy products. The best that these marketing gimmicks do is take away your existing users and your credibility as a company. How many marketing weasels exist in your organization? How much power have you given them? Just a little something to think about. If you don't think about it, your competition will. This post is written using Zoundry Raven and I am liking it. I will continue to switch between Live writer and Zoundry Raven. As of now, I like what I see as far as Zoundry Raven is concerned.